Writing for catalogs is a wonderful niche for freelance writers. There are over 10,000 catalogs published in the U.S. alone each year. Plus countless thousands of catalog pages on the web. Is this a lucrative niche? With fees averaging $100 an hour, its certainly an area worth exploring. Is this course the right one to take? My short answer is yes. This course is published by the American Writers and Artists Institute. I have reviewed a number of their courses, all of which I have found to be filled with useful, practical and actionable information. And heres another reason I would always reach for this particular course. It is written by a gentleman by the name of Herschell Gordon Lewis. Herschell Gordon Lewis is not only a great copywriter, but also a great teacher. I have been writing professionally for over 25 years now, and back in the early days it was his books I purchased and read, cover to cover. In fact, as I started reading through this course, I hadnt even seen who the author was. But after a few pages I began to wonder. The course is written so clearly, with such good, down-to-earth advice, I found myself turning back to the cover to see who had written it. And when I saw that name, I just smiled. The course comes in a binder and is divided into two parts. The first part, over 100 pages, is devoted to Herschell Gordon Lewis walking you through the skills of writing catalog copy. He does an excellent job. What I liked most was how he follows every important point with examples and exercises. In other words, no key learning point is left behind before you, the reader, works on an exercise. This is a great way to teach and learn. Nothing fixes a point in your brain more permanently than having to actually DO it. The second part if the course is actually a list of catalog mailers. There are hundreds of them listed, each with full contact information. So whether your interest is in household goods, garden supplies, sports equipment, food and wine, travel, crafts or one of dozens of other topics...you have a head start in knowing which catalog companies to approach first. There is huge value in this list. Why? Because one of the hardest things to do when starting out in a new writing discipline is to find the right companies to approach. In this course binder, you have hundreds of them listed. Only you can answer that. But if you think you have a skill in writing very brief, succinct copy that can still communicate strong customer benefits, then it may be a fit. For sure, if you take this course and master the craft, youll find plenty of work waiting for you. Catalog writing is a very distinct discipline, and there are not many people who can do it well. Also keep in mind that there are now thousands of web sites with catalog pages of products, all of which need writers with catalog-writing skills. So the opportunities right now are endless. 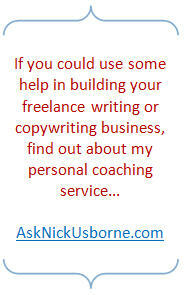 I always advise freelance writers to find a niche and focus their energies in that one area. Catalog writing is one such niche. It isnt a particularly glamorous area, and as a result youll probably find yourself building a business without too much competition.